Primal heuristics play an important role in the solving of mixed integer programs (MIPs). They often provide good feasible solutions early and help to reduce the time needed to prove optimality. In this paper, we present a scheme for start heuristics that can be executed without previous knowledge of an LP solution or a previously found integer feasible solution. It uses global structures available within MIP solvers to iteratively fix integer variables and propagate these fixings. Thereby, fixings are determined based on the predicted impact they have on the subsequent domain propagation. If sufficiently many variables can be fixed that way, the resulting problem is solved first as an LP, and then as an auxiliary MIP if the rounded LP solution does not provide a feasible solution already. We present three primal heuristics that use this scheme based on different global structures. 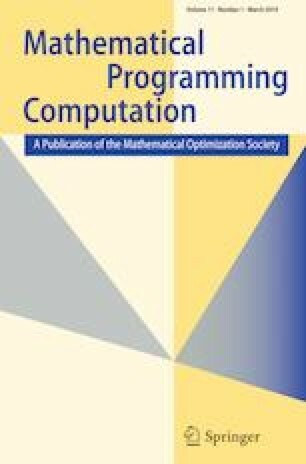 Our computational experiments on standard MIP test sets show that the proposed heuristics find solutions for about 60% of the instances and by this, help to improve several performance measures for MIP solvers, including the primal integral and the average solving time. The work for this article has been conducted within the Research Campus Modal funded by the German Federal Ministry of Education and Research (Fund Number 05M14ZAM). The authors would like to thank the anonymous reviewers for helpful comments on the paper.